It's Sunday and I went shopping with a fellow crafter & friend from Hong Kong! Charmaine was dropping by Singapore on her way back home. We had a great time checking out the supplies shop and stationary / packaging shops. I got this cute mug. Ain't it sweet? I can't wait to use it. 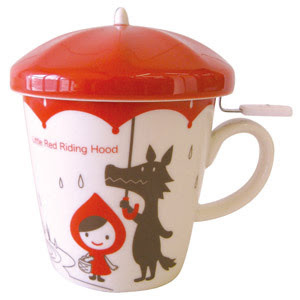 I love the cute red riding hood character. Reminds me of my Red Riding Hood necklace. What do you think? Did you buy anything today? That is adorable!! Is it a tea mug? I'd LOVE to get one for my desk! I too am a bank-worker by day and crafter by night. Can I google it? Who makes it? Our shopping was boring today - a new shredder. boo! 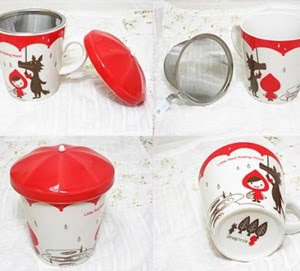 Nope, haven't bought anything :) Cute mug! oh that is cute! i bought my sister a re-usable water bottle that had the same character on it for xmas!